You will be given a Free reference e-book to read which has 582 pages And the test will be based on that e-book. LPI Linux certification is among the most popular certifications provided to programmers and administrators of systems that are based on Linux. Receiving this type of certification allows you to effectively show to the whole industry that you are competent on a specific level. It should be noted that the actual certification exam for all professionals who want to become certified in this field covers a variety of topics linked to the Linux operating system. You can also expect the exams to be accessible in different countries and can be translated into numerous languages. These certification exams are mainly developed using questions answerable through multiple choices. There are also questions that require written answers. Note that while there are tests that can be taken using paper, there are also those that you can take through a computer system. If you plan to take up this exam, then be aware that it usually comes with neutral questions that require a more general knowledge about Linux. 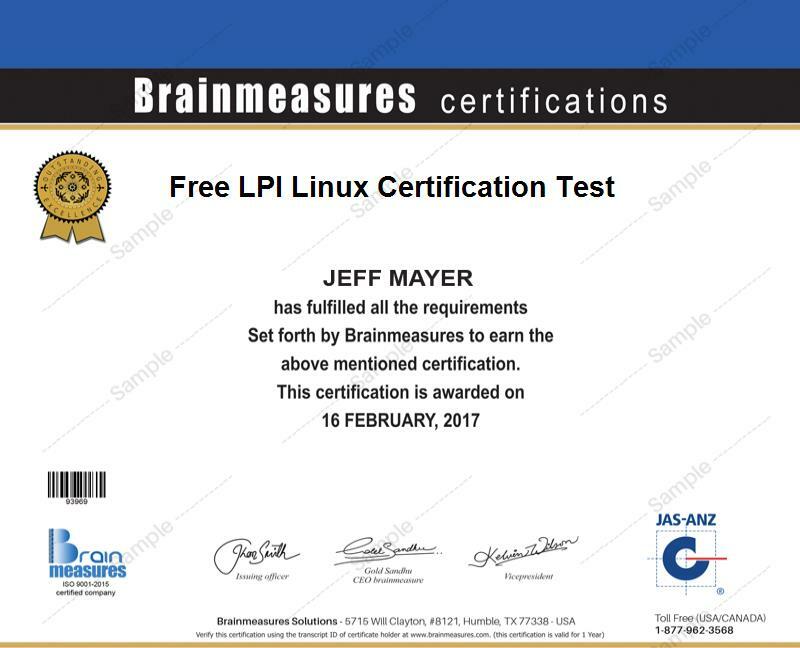 If you want to get a clearer idea about what it takes to pass the LPI Linux certification exam, then you should consider taking up the free LPI Linux certification practice course available at Brainmeasures. This company is well-known for its ability to provide the most legitimate online certification courses and free practice courses so you have a guarantee that its Linux practice course along with the free study guide and practice test are useful in enhancing your ability to grab a copy of an LPI Linux certificate. Enrolling in the free Linux practice course offered by Brainmeasures is one of the best things that you can do especially if your desire to become an LPI Linux certification holder is really strong. This free Linux practice course from Brainmeasures maximizes your ability to become one of the best certified experts in using the Linux operating system since the free study guide which forms an integral part of the course offers the most relevant information about everything related to the Linux system. A free practice test also forms part of the practice course and this is essential in your attempt to obtain a clearer overview about what to expect when taking up the actual certification exam. The free practice course enables you to effectively prepare yourself for the exam, thereby boosting your chances of enjoying a passing result. How to effectively perform your functions with the help of a UNIX command line? How to modify the priorities for process execution? How to obtain complete control over the process of mounting and unmounting file systems? How to effectively manage the ownership of files? How to effectively manage group and user accounts? The free LPI Linux practice course offered by Brainmeasures aims to provide assistance to those who want to easily handle the LPI Linux certification exam and successfully pass it. This is a major help for all aspiring Linux system administrators, specialists, consultants, programmers and anyone who wishes to show to the entire industry that their knowledge and competence in using the system are high in quality through the certification that they hold. Successfully passing an LPI Linux certification exam also enhances your chances of receiving an even higher pay. You can use your certificate to work as an LPI Linux programmer and start to receive at least $51,000 every year. Using your certificate to work as an LPI Linux administrator is also a huge help in enjoying a more stable pay of around $63,000 to $140,000 annually.